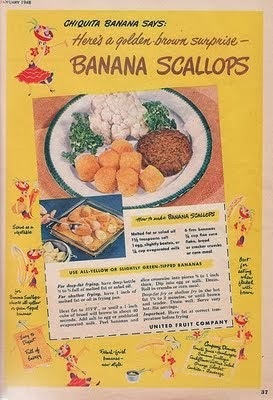 Kitchens Are Monkey Business: More Vintage Recipes. 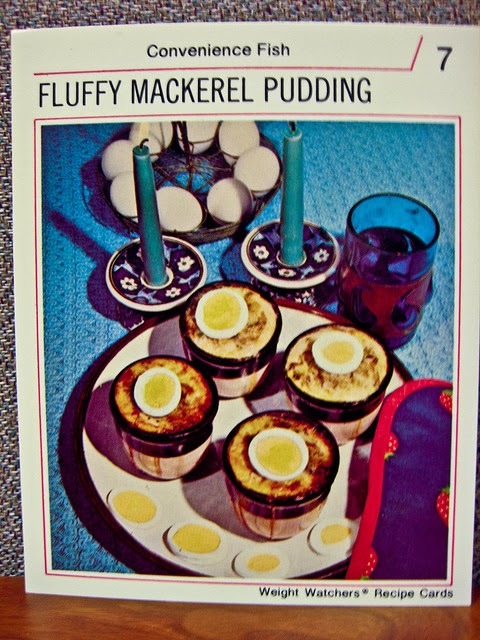 from vintage recipes, did you? I have more for your viewing pleasure! you need to go see them here. Can you imagine being served this? without risk of running short or having wasteful left-overs. I know you'll want this recipe so here it is! Mix these ingredients. Add cold water to make a moist paste, firm enough to handle. Cut 9 oz. steak into thin strips and 3 oz. ox kidney into pieces. Roll in a tablespoonful flour seasoned with salt and pepper, then wrap each piece of steak around a piece of kidney. Grease 4 breakfast cups (or bowls of similar size) and line them with paste. Put in filling (3 oz. per cup); fill with water or stock; cover with paste, then with buttered paper. Tie cloths over and steam for 3 hours. At least that's what I think it said. 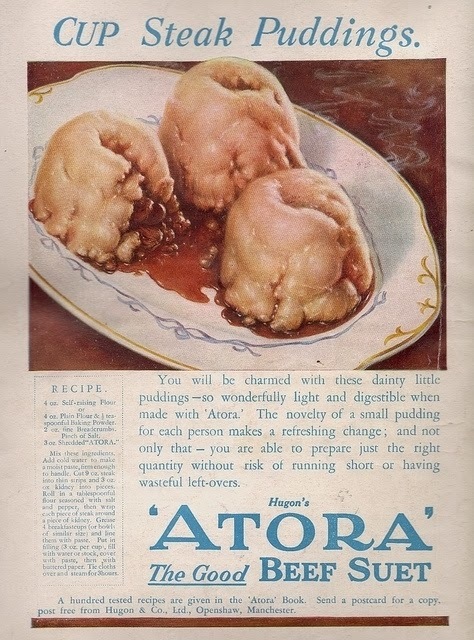 Atora, in case you're unfamiliar with it, is a British brand of shredded suet, which is clarified beef fat, used primarily in the production of pastry and dumplings, which explains a lot. Suet received its earliest mention in a 1617 recipe for Cambridge Pudding. I would be remiss if I didn't offer you more tantalizing recipes for Atora, so please click here for inspiration. 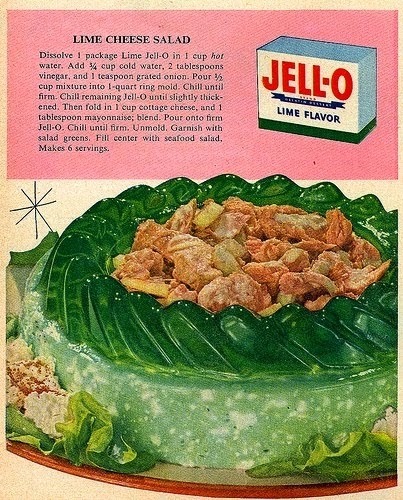 I love a good Jello mold and this one delivers so many ways. 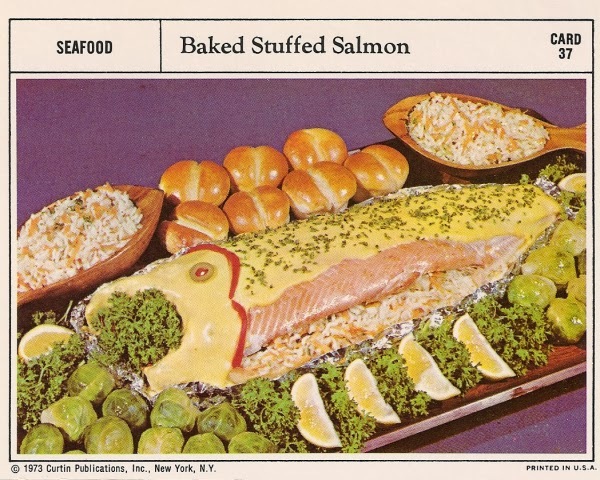 You have your citrus, your dairy, and a dump of "seafood salad." so I have included the recipe. I love the random stick figure star. It screams, "Delicious!" to me. Dissolve 1 package Lime Jello in 1 cup hot water. Add 3/4 cup cold water, 2 TB vinegar, and 1 tsp grated onion. Pour 1/2 cup mixture into 1-quart ring mold. Chill until firm. Chill remaining Jello until slightly thickened. Then fold in 1 cup cottage cheese, and 1 TB mayonnaise. Blend. Pour onto firm Jello. Chill until firm. Unmold. Garnish with salad greens. Dump seafood salad in center. Makes 6 servings. 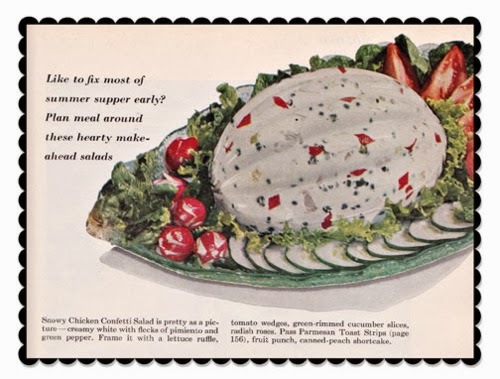 but that "seafood salad" looks suspect to me. I would say it looks "fishy." 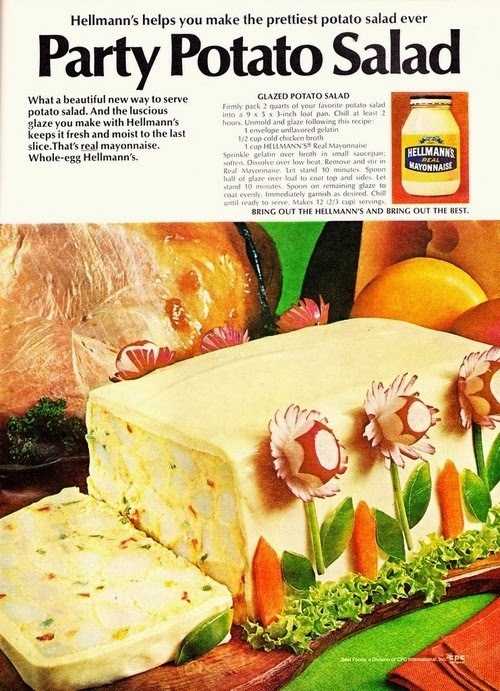 of liverwurst, mayo, and Worcestershire. Oh. Nice touch with the knife. one of your very own,so here's the recipe! 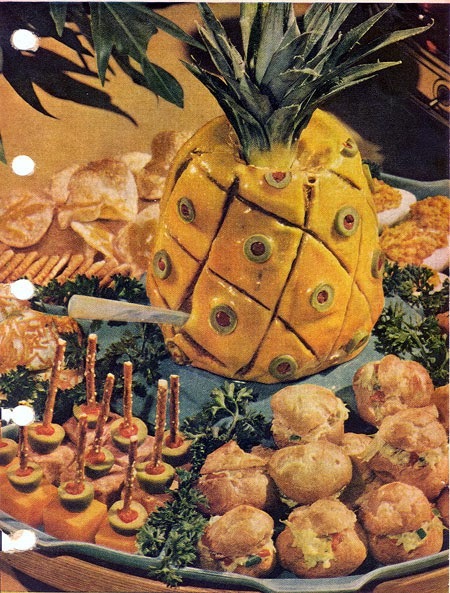 Liver Sausage Pineapple - Three words that do NOT belong together. Mix 1 pound liver sausage with 1 TB lemon juice, 1 tsp Worcestershire sauce, 1/4 cup mayonnaise. 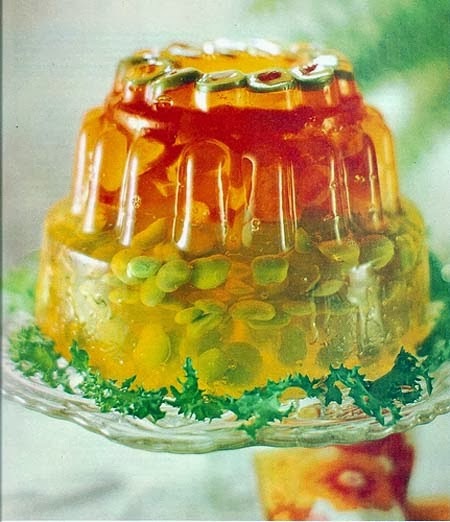 Shape around a jelly glass. Soften 2 tsps unflavored gelatine in 2 TB cold water, dissolve over hot water. Add 1 cup mayonnaise; Chill. Frost "pineapple," score, stud with sliced stuffed olives. Top with real pineapple top. at your next 50s dinner party! with olives and pretzel spears. I would think that would be hard to eat. 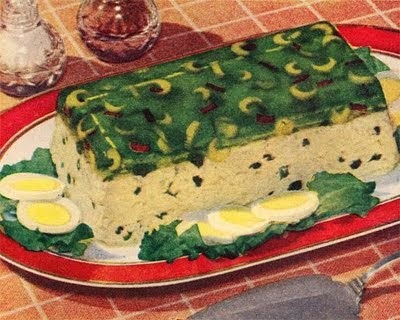 but wait until you see the Super Supper Salad Loaf! Scoop out center of a 1 1/2 pound piece of bologna, leaving a shell. * Soak 1 TB gelatin in 2 TB cold water and dissolve over hot water. Mix 1 1/4 cups cooked mashed peas with 1 TB Real Mayonnaise, 2 tsp minced onion, 1/2 tsp salt, 1/4 tsp pepper. Add dissolved gelatin and pack into bologna shell. Chill thoroughly. Place on platter on salad greens. Heap with Real Mayonnaise. Garnish with radish roses, parsley, and onion rings, as illustrated. *NOTE: Use left-over bologna in sandwich fillings for next day's lunches. What a thoughtful suggestion for bologna "moreovers!" "... and pack into bologna shell." I never would have thought I'd ever write those words. The hits just keep on coming with Monterey Soufflé Salad. 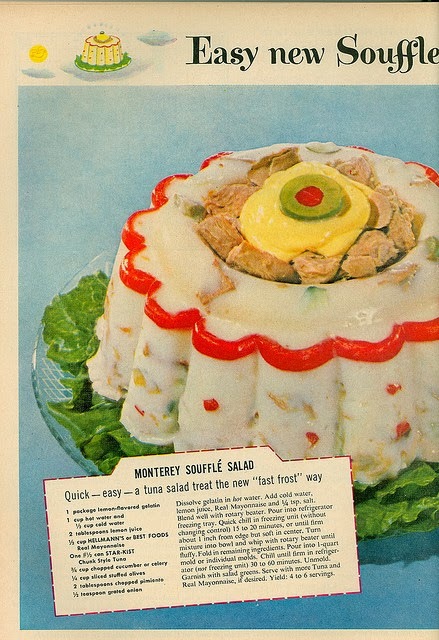 Quick - easy - a tuna salad treat the new "fast frost" way. but I don't think I want to find it. It's got its eye on me. Dissolve gelatin in hot water. Add cold water, lemon juice,mayonnaise, and 1/4 tsp salt. Blend well with rotary beater. Pour into refrigerator freezing tray. Quick chill in freezing unit (without changing control) 15 to 20 minutes, or until firm about 1 inch from edge but soft in center. Turn mixture into bowl and whip with rotary beater until fluffy. Fold in remaining ingredients. Pour into 1 quart mold or individual molds. Chill until firm in refrigerator (not freezing unit) 30 to 60 minutes. Unmold. Garnish with salad greens. 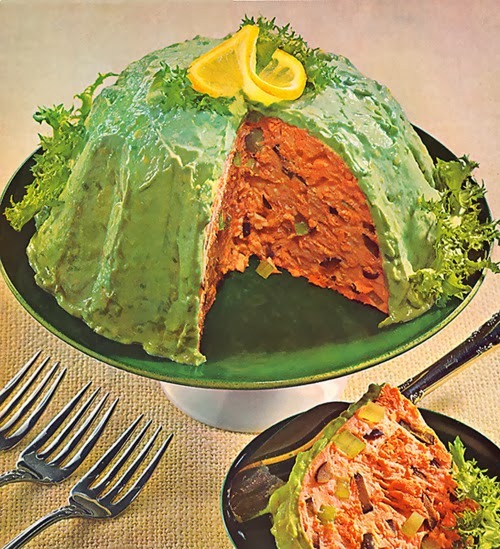 Serve with more tuna and Real Mayonnaise. 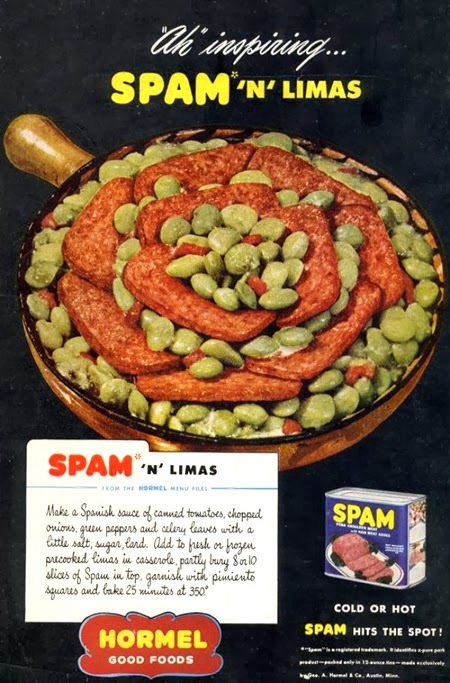 that wonderful food product - spam. Make a Spanish sauce of canned tomatoes, chopped onions, green peppers, and celery leaves with a little salt, sugar, lard. Add to fresh or frozen precooked limas in casserole. Partly bury 8 or 10 slices of Spam in top. Garnish with pimiento squares and bake 25 minutes at 350°. Don't forget the lard in the "Spanish" sauce! Recipe is ruined without it. with a luscious mayonnaise glaze! The glaze keeps it fresh and moist to the last slice. Sprinkle gelatin over broth in small saucepan, soften. Dissolve over low heat. Remove and stir in mayonnaise. Let stand 10 minutes. Spoon half of glaze over loaf to coat top and sides. Let stand 10 minutes. Spoon on remaining glaze to coat evenly. Immediately garnish as desired. Chill until ready to serve. I have a problem with food that's watching me eat it. Heat oven to 325°. Clean, wash and dry fish. Season fish with salt, pepper and lemon juice. Fill cavity with a mixture of rice, carrots, onion and celery. (Any leftover stuffing can be placed in a lightly greased baking dish and cooked along with fish). Top fish with lemon slices. Wrap securely in aluminum foil and bake in a shallow roasting pan – 1 1/2 to 2 hours. Unwrap and test fish with a fork (it should flake easily when done). Scrape off dark skin and slip fish onto a serving platter. Mask with Hollandaise Sauce and decorate with parsley, pimiento and lemon wedges. I like the direction to "Mask with Hollandaise Sauce." I don't think you can mask this enough. I'm not bothering with the recipes anymore. 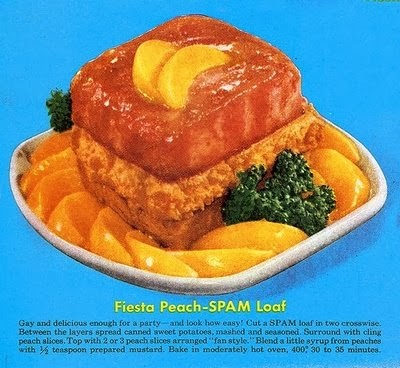 here's Fiesta Peach Spam Loaf! "Gay and delicious enough for a party!" 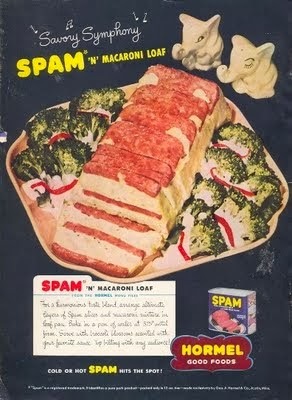 And now we have a Spam 'N' Macaroni Loaf! Must everything be turned into a loaf? 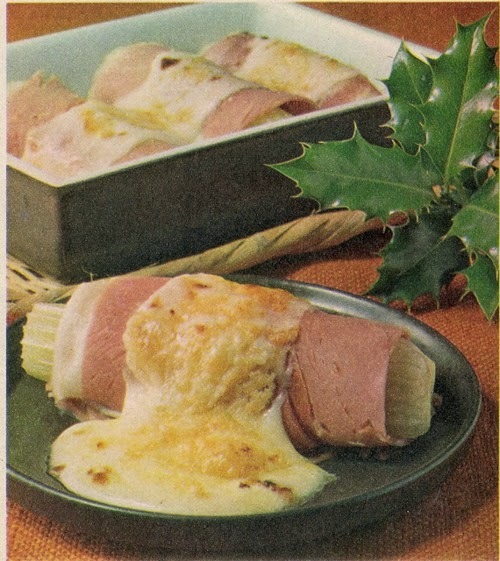 This particularly appetizing dish is Ham and Celery Mornay. 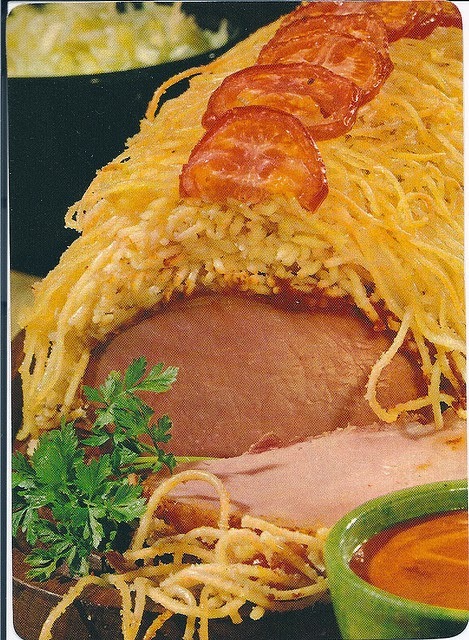 Just what I want to eat - a piece of meat with hair. I would seriously hurt someone. This is Snowy Chicken Confetti Salad. It's "pretty as a picture" with flecks of pimiento and green pepper. 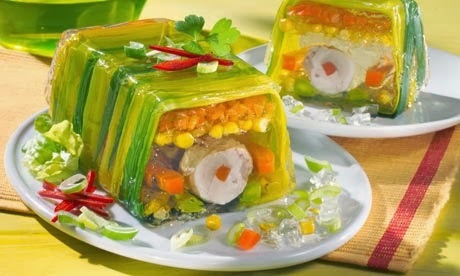 Unfortunately I couldn't find the recipe for this gastroabomination. Who has a melon mold? Someone, please explain the filet mignon part to me. 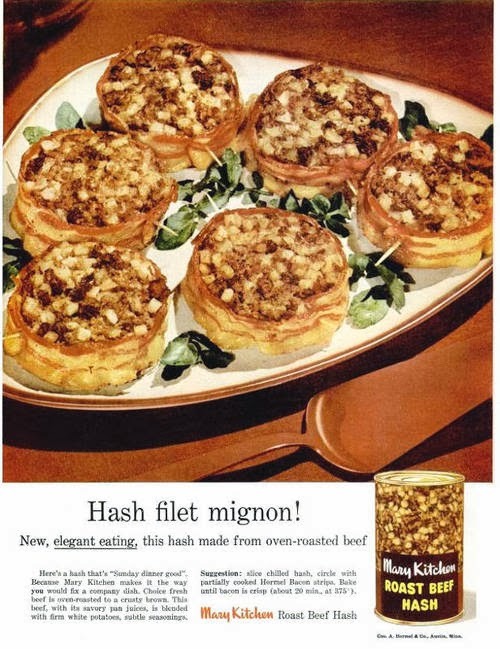 "A hash that's 'Sunday dinner good..."
I actually ate Mary Kitchen Roast Beef Hash as a child. Creamed Veggie-Filled Pancakes with Canned Peach Garnish. That peach half thrown on top is a nice delicate touch. The creamed filling scares me. Did anyone else read this as "Canned Peach Garish?" 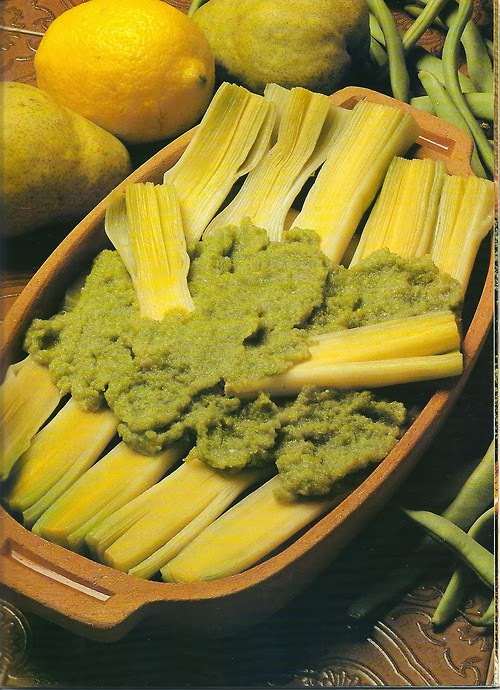 Now who couldn't resist Leeks with Pear and Bean Purée? Remember, you eat with your eyes first! I will leave you with this lovely dish. I have no freakin' idea what it is. And frankly, I don't want to. Dear Rosie, I love vintage recipes.They always are better. There was no skimping. I lost almost all of my old cookbooks that were my moms in Sandy. These are simply priceless. Have a good weekend and keep cozy. It is going to get cold again. Catherine, when Mama Hawthorne passed, I went through her kitchen and brought home all her cookbooks and a bunch of 3 1/2 x 5-inch metal file containers with all her hand written recipes. I left them in my garage and forgot about them. ThatBitchIrene came through and saturated everything. I think I pretty much saved it. Two week sunbath in the driveway. Turning several times a day. I believe you suffered the same and more through ThatBitchSandy. That first recipe--at least it is GOOD suet. Even Ina would appreciate that! Ah, Rocquie. There is that.